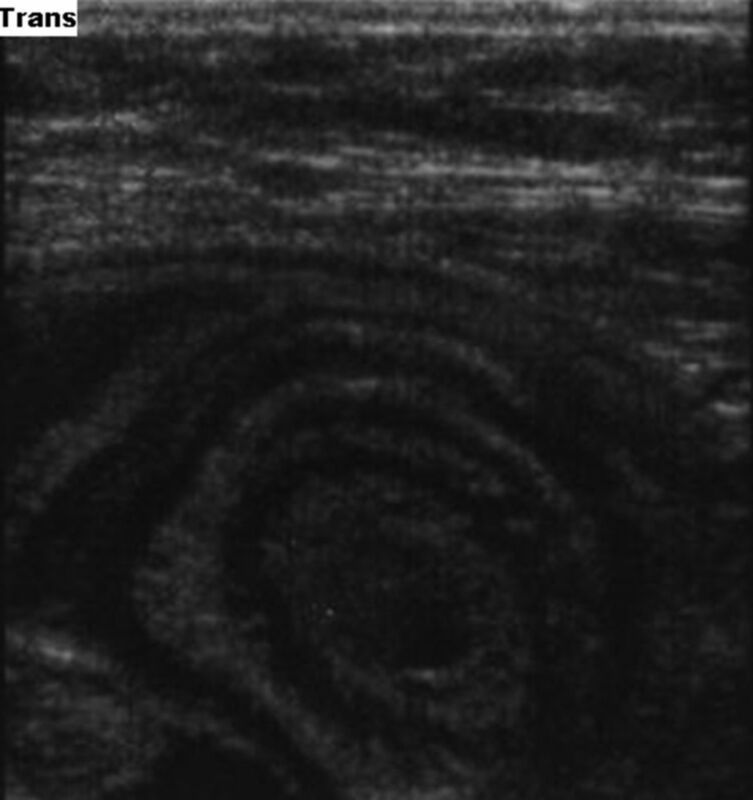 Abdominal ultrasound scan showing typical target/doughnut/bull's eye sign suggestive of an intussusception. Primary intussusception occurs in infancy with peak period between 5 and 9 months of age and is usually ileocolic while its occurrence at 4 years of age and ileoileal location is unusual. The reported sensitivity and specificity of ultrasound scan in the diagnosis of intussusception are almost 100%. Ileoileal intussusceptions beyond 2 years of age usually have a lead point, the commonest being Meckel's diverticulum. Appendicular mass is treated conservatively, followed by interval or no appendicectomy in children, while an intussusception is a strangulating obstruction requiring urgent intervention. If a tender mass is palpable and the inflammatory markers (isolated rise in C reactive protein is an indicator of bowel vascular compromise and inflammation) are not in keeping with appendicular mass, lateral thinking and low threshold for urgent ultrasound to confirm or refute clinical diagnosis help, and air enema reduction is unfortunately not available for this entity and needs an operative intervention.
. Caeco-colic intussusception simulating an appendicular mass. Webmed Central Surg 2012;3:WMC003206.
. Inflammatory myofibroblastic tumour with ALK/TPM3 fusion presenting as ileocolic intussusception: a usual presentation of an unusual neoplasm. Hum Pathol 2006;37:112–16.
. Intussusception of a normal appendix. Am J Emerg Med 2000;18:115–17.
. Barium enema reduction of intussusception in a developing country. West Indian Med J 2010;59:535–9.
. Pneumatic reduction of intussusception in children at Korle Bu Teaching Hospital: an initial experience. Afr J Paediatr Surg 2011;8:176–81.
. Ultrasound guided hydrostatic reduction of intussusception in children at Korle Bu Teaching Hospital: an initial experience. Ghana Med J 2011;45:128–31.
. Laparoscopic reduction of intussusception in children: role in primary and revisional reduction after failed non-surgical therapies. Int J Health Sci (Qassim); 2011;5:71–8.
. Air encircling the intussusceptum on air enema for intussusception reduction: an indication for surgery? Br J Radiol; 2011;84:719–26. Contributors All the authors have made substantial contributions to the conception and design of the article, the search of literature, the acquisition, analysis and interpretation of the data, drafting the article or revising it critically for important intellectual content, and to the final approval of the version to be published.